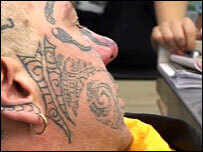 A world record tattoo attempt in the Black Country had to be abandoned after a participant went into shock. Garry Hobbis started shaking and suffered swelling 16 hours into the planned 48-hour session in Dudley. He was having landmarks in Dudley tattooed on him to raise hundreds of pounds for a girl who had her limbs amputated after contracting meningitis. Five-year-old Ellie Bishop, from Oldbury, nearly died after being rushed to hospital in March.